Mitsubishi Motors has selected Hawaii to be the first state to receive the North American version of the company's 100% electric-powered Mitsubishi i production vehicle beginning in November 2011. The manufacturer's suggested retail price for the base ES model of the new Mitsubishi i electric vehicle is $27,990 in Hawaii. 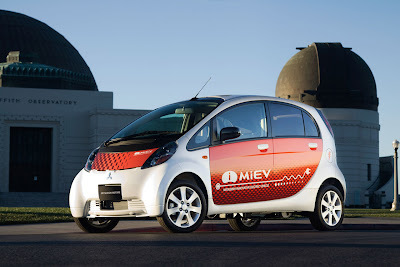 Beginning April 22, 2011 Hawaiian consumers will be able to reserve their own Mitsubishi i with a fully-refundable deposit of only $299 at the website i.MitsubishiCars.com. Mitsubishi anticipates deliveries of the five-door 2012 Mitsubishi i to its dealership network in the western US, specifically Hawaii, California, Oregon, and Washington, in November 2011, with entry into the northeastern market to follow by March 2012 and availability across US by the end of 2012. "We thank Mitsubishi Motors for choosing Hawaii as one of the first states to receive the new "i" electric car. Electric vehicles use a fraction of the fuel needed by traditional cars, so each EV on the road means we're reducing our dependence on imported oil and increasing our ability to reach Hawaii's goal of 70 percent clean energy within a generation," said Estrella Seese, Acting Energy Program Administrator, Hawaii State Energy Office.